Dev became conscious of the faint buzz in the background. It sounded like a jet airplane. Was he inside an airplane? He opened his eyes and realized that he was flying above a desert at very high speed. No, he was not inside an airplane above the desert. He was flying like a bird. It was exhilarating. He could see the desert below him as far as the eye could see. He saw the sand dunes and at first he couldn’t see a soul. The vast desert seemed to him as desolate as the landscape on Mars, except this was golden in color, not red, and there were no rocks dotting this desert, but sand dunes—endless sand dunes. He came upon a camel caravan travelling underneath. There must be at least sixty or seventy camels with men and women riding on them. There were other people walking alongside the camels. All the men were wearing white kurtas, white dhotis, with brightly colored turbans on their heads, each unique in design and bright colors, each distinguishing one individual from another. The women were attired in colorful lehangas and ornees—bright orange, lemon yellow, turquoise, scarlet red, lawn green, magenta pink, amber… It was a magnificent extravaganza of colors. Dev slowed down and descended to just a few feet above the caravan. He noticed that most of the men were tall and handsome, with long curly moustaches. The younger women were beautiful and the older ones looked stately. All in all, the bright colors of their garments, the camels, the endless desert and the people themselves looked like a scene from a movie Dev had seen several years ago on the Indian city of Jaisalmer. Dev had done extensive research on Jaisalmer and its history. Jaisalmer was a border town in the western Indian state of Rajasthan, which was an exotic mix of magnificent gold-colored sandstone mansions interspersed with sand-colored homes right in the middle of the famous Thar Desert. There were sand dunes all around the city for miles. It was an old trading post town on one of the branches that connected to the Silk Road via the Punjab and the North West Frontier, in the middle ages. By the mid-nineteenth century, maritime trade had taken over. The old Silk Road towns had declined and become ghost towns, to be revived again only in the mid and late 20th century as international tourist destinations. From the 1700s through the 1800s though, Jaisalmer had been in full bloom. Traders from all over India, China and the Middle East visited and the economy thrived. Jaisalmer’s cosmopolitan nature and riches had added even more dynamism, vibrancy, spice, and fun to an already colorful Rajasthani culture. The people of the area were from a migrant stock, tall, almost Persian in complexion and generally handsome. They loved their music, art, architecture and dance. They also loved their wars. They had a side to their character which was warlike and fiercely independent. As Dev recalled all of this, he asked himself if he was really in or around Jaisalmer. If so, how did he get here, and why? As he flew past the camel caravan, he realized that the sun was setting, giving the desert a golden-red glow. The sun itself looked orangish-red and was looming on the horizon, ready to set. The whole scene looked like a dream…wait a minute! He was dreaming. He saw some smoke arising from what looked like a town at a distance. He picked up speed and headed towards the smoke. As he flew over town at a low altitude, his suspicions were confirmed and he instantly recognized the late eighteenth century Jaisalmer from his readings and the paintings he had seen. Narrow streets, paved with rolled compacted sand mixed with clay, magnificent temples rising up from the desert, and bazaars displaying just about everything under the sun. Men and women walked around in rich colorful clothes and the sound of local musical instruments filled the air. 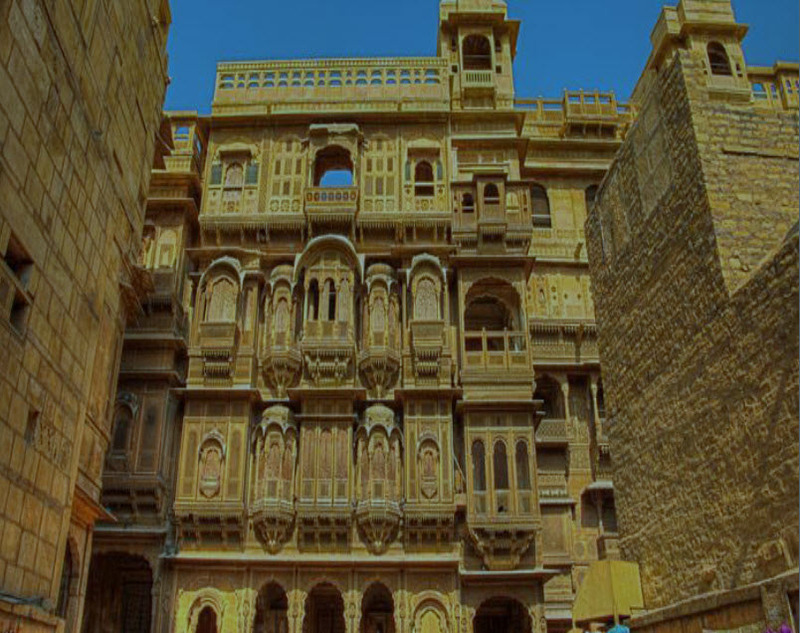 The magnificent mansions of Jaisalmer, with intricately carved facades dotted by hundreds of ornate jharokhas looked mysteriously charming in the setting sun, partly shaded and partly lit by the sunlight. 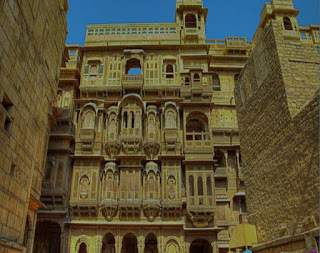 Suddenly, Dev found himself above a mansion, perhaps the grandest in Jaisalmer. It was enormous in size and the carving was exquisite. It looked newer than any of the other mansions and his eyes fell upon a tall, imposing man standing on one of the jharokhas . He was richly adorned in an off- white silk tunic and a turquoise-colored dhoti that reached well below his ankle. He wore a necklace studded with large deep green round emeralds. Emerald necklaces were a symbol of the very top in Rajasthani merchant hierarchy. He had a large diamond ring on his left little finger which seemed to emit a blue florescence. He had smooth pale skin and looked like he was in his late 20s. He was not wearing any turban and his thick black hair was shoulder length and neatly brushed back from his forehead. Unlike most men Dev saw in town, the man in the balcony was clean shaven. He was talking to a middle-aged European-looking man. Dev was now convinced he was in some sort of a dream. A European in Jaisalmer in early nineteenth century? The young man in the balcony had the bearing and manner of a man with authority and he just stood there, staring at Dev. Dev remembered something and smiled as if he had just solved a mystery. He clearly recognized the mansion and the man. Excitedly, he flew closer. A slightly detached yet curious half smile of recognition flashed across the man’s face as Dev neared. Dev tried to fly even closer, but he couldn’t, no matter how hard he tried. Then he felt a tug that pulled away from the mansion. He tried to wave to the man, but to no avail. From a distance he saw the man in the mansion raise his right hand close to his chest, palm facing out, in a Buddha-like gesture which signified a blessing. Dev strained to reach out to him by extending his arm, but everything went dark and Dev was back in deep sleep. Of all the places that Dev could have dreamed about while in his coma, it is perhaps not unusual that his state of mind should have triggered thoughts of Jaisalmer. This beautiful town situated in Rajasthan has a very important place in A Perennial Stream. A Perennial Stream's author, Penn Bobby Singh, wrote these words about Deoraj upon his passing. It got me thinking....Is it better to walk away from success if it is not on one’s own terms ? What do you think? Is it success at any cost, either to yourself or to others? I've had the pleasure to read A Perennial Stream and am, in fact, reading it a second time. I find a second read of a book I have enjoyed gives even more pleasure the second time round. You find yourself either validating your opinion of characters or, occasionally changing them, and spotting things you missed the first time round. I came away from my first read caring about Deoraj. This second read has only cemented my admiration and affection for a man who I shall never meet but who, in many ways, reminds me of my own father. He was also a kind, loyal man who always tried to do the right thing. It's only with rereading the book that I noticed that there was a familiarity to Deoraj that I'd not recognized. Anyway, I'm at the point in my second read where Deoraj dies. My own father died younger than he should have and he, too, had a weak heart. He died instantly after a heart attack. 'Deoraj Singh Bapna of the Bafna clan was fifty-seven years old when he passed away. Most first-generation success stories involve men who started with nothing and without the advantage of a good education or culture, were somewhat crude and almost uncouth. They didn’t think twice about using any means at their disposal, legal or illegal, brutal or not so brutal, to climb up the ladder. Deoraj was the exception. Despite starting with nothing, he set the highest standards of honesty, integrity, culture and compassion, which some even in his future generations found difficult to uphold, despite having all the advantages of money, power and influence. The amazing thing, however, was that there were others among his succeeding generations who were able to meet his high standards, inspired by the values he inculcated in his son and which were passed on from generation to generation. Deoraj had a certain innocence and child-like quality about him which led most people to consider him naïve or simple-minded. In reality, it took a high degree of intelligence and strength of character for any man to start at the bottom and achieve what Deoraj did, without hurting anybody along the way and without compromising his self respect. 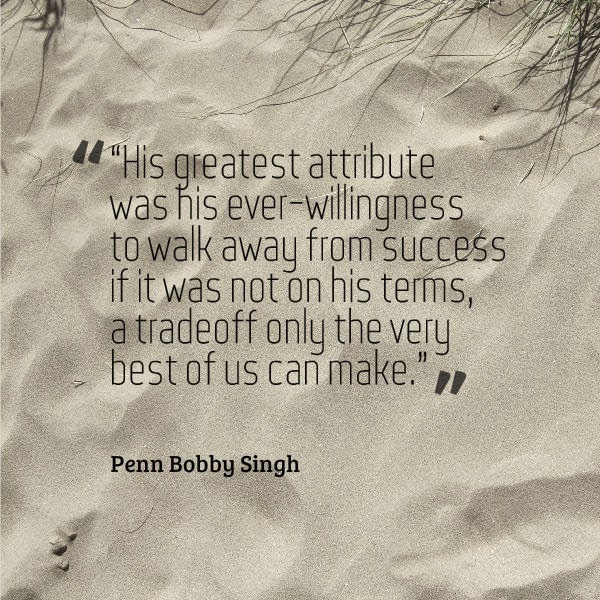 His greatest attribute was his ever-willingness to walk away from success if it was not on his terms, a tradeoff only the very best of us can make. The setting for A Perennial Stream flows between India, Europe and the US. For a first look at the book, here's a passage that takes place in the US. We hope you will enjoy. Please let us know what you think. Any thoughts and discussion would be very welcome. Thank you. He started dreaming again. A good-looking older man came into focus. This man was making a speech inside a packed chamber, addressing a crowd of men in business suits sitting on classroom type chairs. AJ could only hear bits and pieces, straining to make sense of what the man was saying. The man was well groomed and not only exuded confidence, but also seemed to be inspiring it in his audience. The man’s words travelled in slow motion to AJ’s ears. He heard something and then the words “welfare queen.” Next he heard “shining city on the hill,” and then he heard “government is the problem,” followed by “the evil empire.” Light bulbs went off in AJ’s mind and he recognized the man. It was Reagan. As soon as he realized that, AJ suddenly found himself sitting on the steps of the Lincoln Memorial, watching the sun rise over the Capitol. The sky was cloudless and it promised to be a lovely day. Its morning in America again, thought AJ, as he looked at the red button he was holding which said “Reagan/Bush 80.” He had saved this one button from back in his college days when he volunteered for the Reagan/Bush campaign. In a flash, AJ was driving a large black Cadillac through the streets of Washington. He was in the northwest section. The buildings all seemed to be shiny and located on top of a hill. With no warning, AJ found himself in the southeast section of the city. Dilapidated buildings falling apart, trash everywhere, abandoned lots, boarded up shops, and young black kids soliciting drug sales attack the senses. AJ started looking for Welfare Queens. He didn’t know what or who to look for, but he just started asking around—for Welfare Queens. One kid said he didn’t have Welfare Queen, but he just got a new shipment of some mind-blowing Hawaiian. AJ shook his head. He didn’t think Welfare Queens were Polynesian. The kid did promise to inform his supplier that street demand for Welfare Queen was heating up. AJ was getting desperate now. He started frantically knocking on doors, one dilapidated building after another, looking for the Welfare Queen—just one Welfare Queen. No such luck. AJ now saw himself in Camden, NJ. He had just arrived from downtown Philly, where he had spent the whole day searching for Welfare Queens. Why could he not find any Welfare Queens? They must be very cagey, these Welfare Queens. They must be hiding. Hiding from whom, though? President Reagan? Why? Why would anybody want to hide from a kindly old grandfather who brought morning in America again and put all of America on a shiny hill? Or was it the shining America on a hill? Whatever… Anyway, AJ was very confused. No matter how hard he tried, he just couldn’t locate the Welfare Queen. Just as he was about to give up he saw a black woman driving an old junker of a Cadillac. It stopped in front of a pathetic looking row house. The woman got out of the car, went around and started pulling at the passenger side door. After a few tries the passenger side door gave way and a young Asian man, probably Chinese got out. The woman was wearing fake fur and smelled of cheap perfume. There was a halo around her head. There she is, AJ thought. Finally, I have found the Welfare Queen. As he moved towards her, she disappeared inside the house, with the Asian man. AJ waited outside the row house. After a while, the Asian man came out. AJ started to go in, but he felt something hitting him at the back of his head with a heavy thud. He blacked out. When he awoke, AJ was lying on a filthy bed. He saw a little black boy and a little black girl running around, laughing. They were wearing cheap t-shirts and shorts. The room had junk everywhere, and an old refrigerator in the corner of the room was open and almost empty. He looked to the other side, and lo and behold—there was the Welfare Queen! Shangri La! Her clothes were cheap, but her movements were elegant and catlike, and she had a natural elegance, which she wasn’t even conscious of. She moved forward and offered AJ a cup of black coffee. “How do you feel now, Hon?” asked the Welfare Queen. “You will be fine. You are lucky it was not a hard blow. You should be careful in these parts, you know,” said the Welfare Queen. “You are the Welfare Queen, right?” asked AJ. She turned around and smiled the prettiest, warmest smile he had ever seen. He felt the warmth of that smile envelope his body as he slipped back into deep slumber. "A kiss up, kick down sort of person". What does it mean to be a "kiss up, kick down sort of person" ? Do you know anyone who fits that description ? Can self respect and dignity go hand in hand with being a "kiss up, kick down sort of person" ? Why did I write the book - To primarily tell a true story of an amazing dynasty which came to live by a strong set of values, through thick and thin, constantly struggling to find dignity in their own lives and that of larger human community. The story itself, even without any messages is fascinating, but the book is much more than just a gripping story. It is a wide canvas book which fits into many genres, several of which are listed above and explores a myriad of subjects, again, some of which are mentioned above.